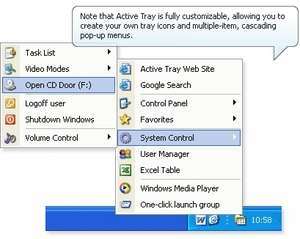 Active Tray is a third party launcher for Windows which sits quietly in the Windows system tray and provides further functionality not found by default in Windows. Generally, you can use Active Tray to manage hotkeys, launch programs and access commonly used folders and applications with 2 clicks. Make your folders, documents, URLs and programs accessible with one key press! Active Tray 2.2.1 is a shareware program and can be used as a demo to try the software until the free trial period has ended. A full version of the program is available after the trial period ends. For security reasons, you should also check out the Active Tray download at LO4D.com which includes virus and malware tests. Additional screenshots of this application download may be available, too.